No. 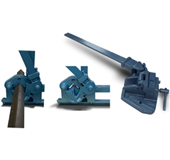 4 Angle Iron Shear is offered with three types of shear blades; standard, contour and special. The standard blades are installed at the factory and all No. 4 shears are shipped with these blades. Other blades must be purchased separately and installed by the user. The No. 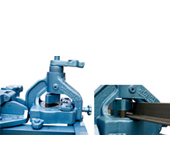 50 Angle Iron Notcher is a useful tool for notching or coping angle iron. It can be used in the shop or on the job site. Coping and special degree notching blade and dies are available. Consists of No. 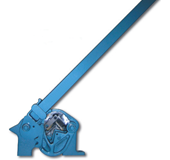 4 Angle Iron Shear, No. 50 Angle Iron Notcher and No. 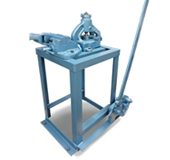 51 Angle Iron Bender mounted on a sturdy floor stand.